One of the more frustrating tasks of your job is calling the IRS on your clients’ behalf. These calls can take a significant amount of time and often prove to be major time investments. But, they are a necessary evil in this line of work. Fortunately for you, IRS calls are our specialty, and we have access to valuable information that will help you handle this aspect of work. In this article, we are sharing data from thousands of calls to the IRS. From our findings, you will be able to save time on hold and negotiate cases faster than ever before. We called the IRS 10,000 times from April 2016 to April 2017 between 8 AM EST to 11 PM EST (8 PM PST). These 10,000 calls were all made by our enQ automated calling software. In our study, the average wait time for a call to the IRS Automated Collections for Business (ACS-B) line is just over 70 minutes. 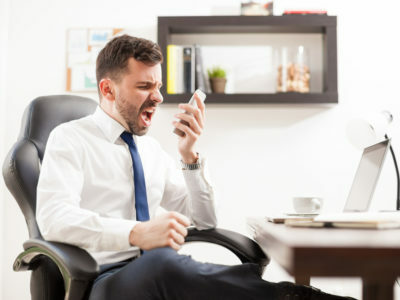 When you take into account having to call back if you get disconnected, you’ll see an effective hold time of a staggering 108 minutes to get through to an agent. 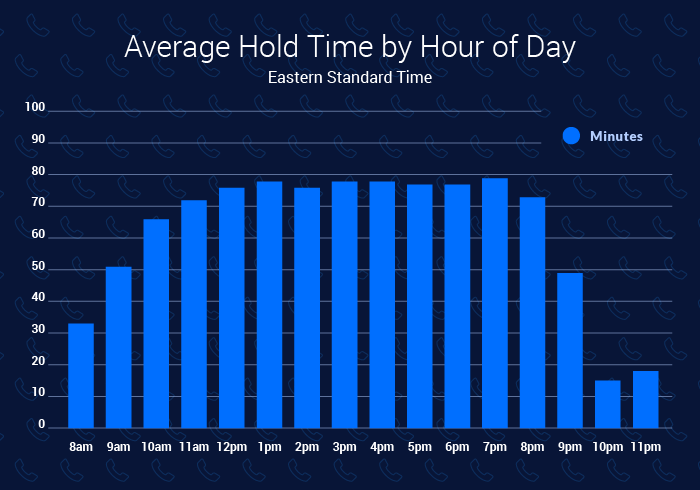 Our calls presented some interesting findings around hold times. Calls after 9 AM jump significantly with calls over 50 minutes and as much as 80 minutes from around 1 PM to 5 PM. Once the Collections office closes at 8 PM (for East Coast callers), we see a drop in hold times. The IRS is effectively closed for 47% of all Americans who live in the Eastern time zone. California callers should call after 5 PM Pacific time to dramatically reduce their hold time. Out of the 10,000 calls, disconnects on the IRS ACS-B line were highest from November 2016 – December 2016. 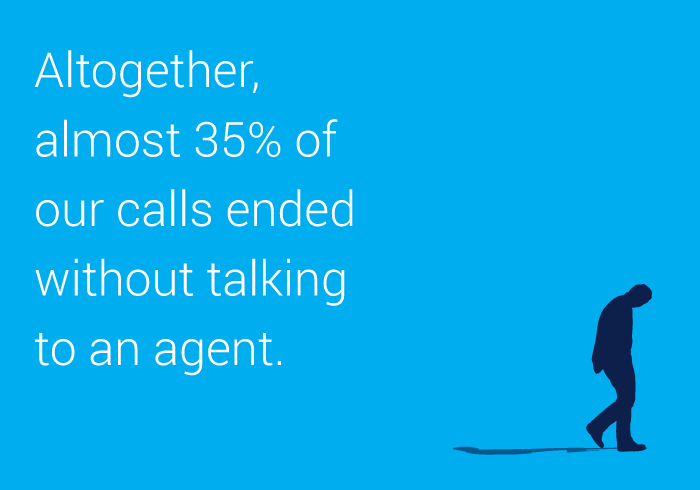 During this period, only 65% of calls were able to get through to a human–more than one-third of our calls were disconnected. 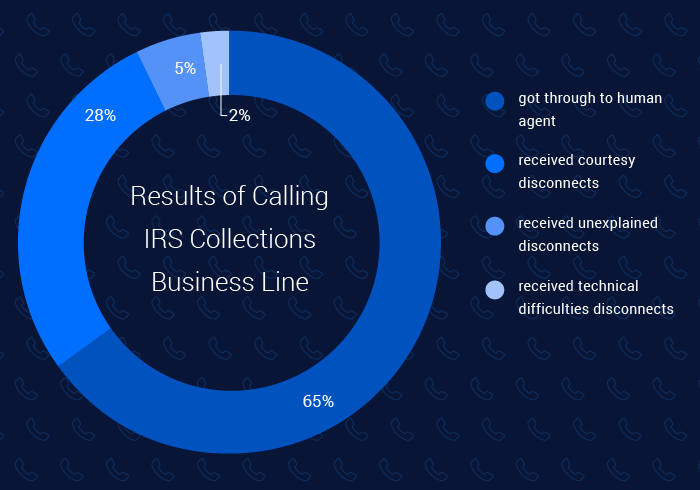 Our study showed that 1 out of 3 calls to the IRS Collections Line for Businesses would be disconnected, with this sometimes occurring after 2 hours of waiting. Your chances of getting to speak to someone about your client’s problem aren’t great, even after significant hold times. Just under 3/10 of our calls received a “courtesy disconnect”, meaning we received a message asking us to try calling back at a later time or the next business day due to the extreme call volume on the topic of choice. Here is the “courtesy disconnect” message we heard. These courtesy disconnects are fairly infuriating and usually not much of a courtesy since we also found that most of these disconnects occur after long wait times of up to 2 hours. If you are fortunate, you could get this message early in your call, but that wasn’t our experience. In about 5% of our calls, we received a disconnect message due to brief technical difficulties. Again, this could occur at any point during the call. Since technical problems are not scheduled, the disconnects happened abruptly throughout all wait times. Here is a recording of what you hear on these disconnects. Only 1% of the calls we made resulted in disconnects for unexplained reasons. The drops appear to be random and happen unexpectedly. Calling the IRS is a minefield of hit or miss, and chances are you’ll only get an agent 2 out of 3 times. You might think that you will have a lot of time to handle other tasks while waiting for someone to pick up your call, but psychology and neuroscience research has consistently shown that multitasking is a myth. 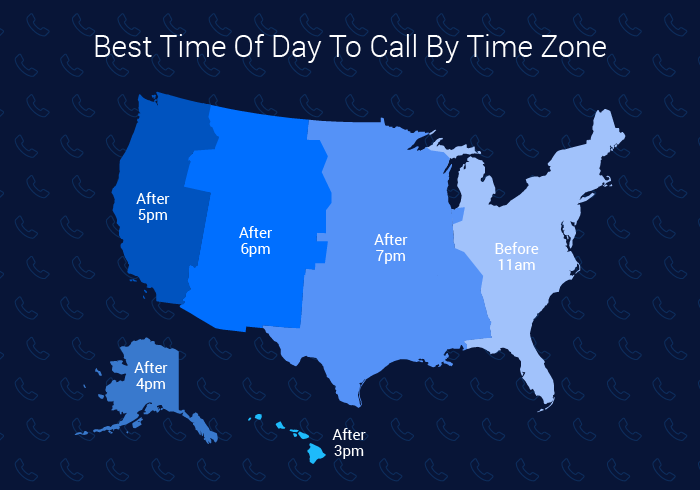 From our call data we can tell you that the best opportunity to get through is usually before 11 AM on the East Coast, or after 8 PM EST for every other time zone, because 47% of the population lives in Eastern time zone and will be off the phones at that point. Although we learned a lot about how the IRS handles calls, we also learned more about the system that can be used to improve your chances of getting through–and talking with a person–in the least amount of time. The average hold time or ACS collections Business was over 70 minutes (8AM EST to 8PM PST). The effective hold time (the average amount of time on hold, including dropped calls) is 108 minutes. The IRS hold music is probably one of the most-heard pieces of music with over 100 million calls a year and long holds. A call at 8 AM EST is only on hold for an average of 38 minutes, the shortest hold for any time during a standard work day. The line is open from 8 AM EST to 8 PM PST, but your open and close time depend on your area code’s time zone. Call length on Friday evenings is shorter than any other weekday. There is a significantly higher number of calls of Mondays and Tuesdays resulting in fewer successful calls. Will the IRS Customer Service Hold Times Get Better in the Future? President Trump has proposed a $239 million budget cut for the IRS, the latest in a long series of cuts since 2010. This could cut into staff size or availability and extend hold times. But it could also force the IRS to improve their systems and streamline their processes. It is yet to be seen if a smaller government yields a more efficient government with better customer service or a slower system. Skip the IRS hold time, negotiate cases faster, and talk to the IRS when you want to. Sign up for a free trial today. This post highlights some of the insights we gained from more than 10,000 calls to the IRS. Download our full report to get data on both the IRS ACS Individual and ACS Business lines, along with comparisons and conclusions for each. Hi, the IRS is closed at 7pm local time. Using EnQ, you can virtually call the IRS from a California number at 6pm, which is 8pm Chicago time, which is 1 hour after they closed for Chicago. I wonder how many people read this article while on hold with the IRS, like I am…22min and counting with that repetitive hold music drilling a hole in brain. All because I labeled a 941 deposit to the wrong Qtr, $#! What they didn’t chart in this article, are the differences in waiting times close or far from filing dates. I’m 2 days from the 3rd quarter filing, so I’m probably looking at a looong wait. I keep getting disconnected when I finally talk with an person and I’m explaining why I’m calling. It sounds like you experienced a courtesy disconnect. This happens to some IRS departments more than others. In some circumstances, EnQ will automatically move you to another agent.